Bharat Sanchar Nigam Ltd (BSNL) leading GSM mobile service provider has introduced exciting range of new Postpaid Tariff plans dubbed as Plan99, Plan225 and Plan325,Plan 525, Plan725 and Plan1500 which offers Unlimited Free Local,STD and Roaming calls, lowest Local calls as low as 20p, STD Calls as low as 30p, SMS and GPRS tariff. With the new revamped wide range of postpaid plans, BSNL subscriber can have options for ‘Pay Per Second, [email protected] paisa, Free Night Callings, Free FnF, Lowest Roaming call charges and Unlimited Local/STD and GPRS as suitable to their pockets. ->Night Speak facility -Enjoy Local and STD BSNL calls @ 50% of the normal rate during night hours between 23 00 hrs and 07 00 hrs. ->STD Calls to all Network @ 0.50 paisa/min. ->Night Speak facility-: Enjoy Local and STD BSNL calls @ 50% of the normal rate during night hours between 23 00 hrs and 07 00 hrs. ->Night Speak facility -Enjoy Local BSNL calls absolutely Free and STD BSNL calls @ 50% of the normal rate during night hours between 23 00 hrs and 07 00 hrs. 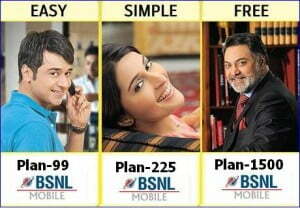 PLAN 725 ->Now Calls & SMS to BSNL numbers with in Home LSA (Mobile & landline) for Free of cost. PLAN 1500 (New Plan) ->A new PLAN 1500 introduced with the following features ->All Calls to BSNL numbers anywhere in India (Mobile & landline) for absolutely Free of cost. Can someone please explain what 15 sec pulse rate means in the plan-325?